Six people have been arrested by police investigating the theft of several thousand pounds from an ATM. Detectives believe street lighting and alarm wires were cut at a shop in Trory, in Co Fermanagh on the outskirts of Enniskillen in the early hours of Thursday before thieves forced entry to the premises. Several thousand pounds was stolen from an ATM in the shop during the incident which is believed to have taken place between 1.30am and 5.30am on Thursday. 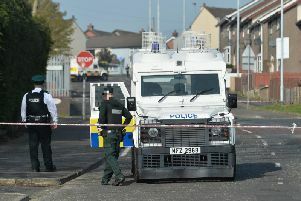 Later on Thursday police arrested and a woman and five men, aged between 22 and 51, in the Crossgar area. Detective Inspector Trevor Stevenson said the burglary was reported to police around 11am on Thursday. He issued an appeal for anyone with information to contact police. "We believe the perpetrators cut the street lighting and alarm wires prior to forcing entry to the shop and were then on site for a number of hours," he said. "The suspects, a woman and five men all aged between 22 and 51, were detained during a proactive police operation in the Crossgar area last night. "They remain in custody at present, assisting us with our inquiries. "I am appealing for anyone with information that could help our investigation to please get in touch with us. I am particularly keen to hear from anyone who may have been travelling on the Irvinestown Road between 1.30am and 5.30am on Thursday 2 August. "Please call 101, quoting reference number 1165 02/08/18."